There were six performances in the Chapter House of King Henry the Fourth, a version of Shakespeare’s Henry IV Part I with some scenes from Part II. Michael Mayne OKS returned to produce and to play Prince Hal, with Nicholas Raffle as Falstaff. Two afternoon concerts were given in the Dining Hall, converted into the ‘King’s Hall’. The soloists were Miles Baster (violin), who also led the orchestra, and Christopher Featherstone (trumpet) on the Tuesday, and piano teacher and well-known virtuoso Ronald Smith on the Thursday. The Military Band, directed by ‘Paddy’ Purcell, played two concerts on Wednesday and Friday afternoons. They also played on Speech Day. 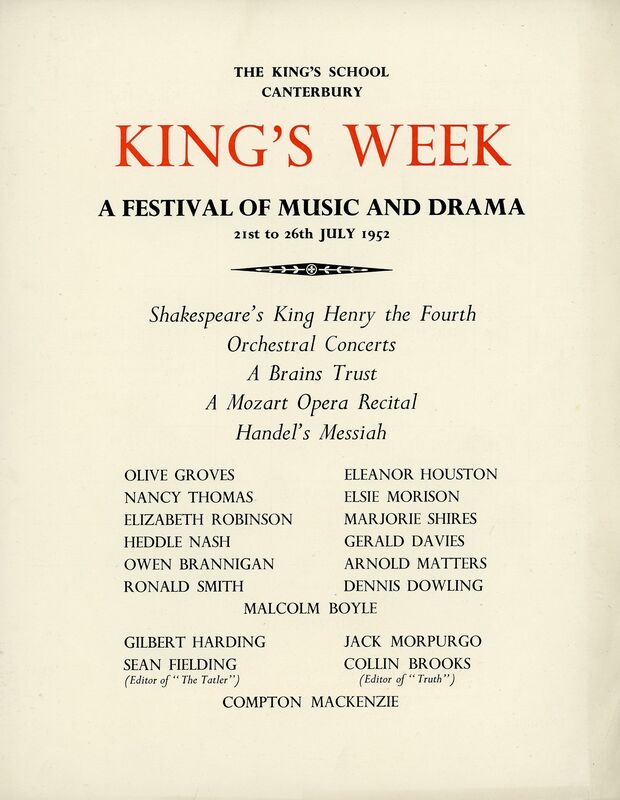 Guest performers were a major feature of the early King’s Weeks. Soloists from the Sadler’s Wells Opera Company performed abbreviated versions of The Marriage of Figaro and Cosi fan Tutte in the Chapter House. The Brains Trust featured nationally known figures. And a remarkable quartet of soloists was obtained for Handel’s Messiah: admission was by programme only (price 2/6) and there was no applause in the Cathedral. A Photographic Society Exhibition, an Art Exhibition and a Natural History Society Exhibition were also held. The Kentish Gazette reported the events of King’s Week in great detail, even noting the jackdaw called Jake at the Band Concert. The Week was a “brilliant success” with “a highly successful series of events”.